My father is Ilonggo but we never set foot in Iloilo in our entire lives, except my dad. My dad usually cooked Ilonggo dishes like batchoy, KBL (kadios, baboy and langka) and the grilled pork legs in monggo soup. I love the latter of all his recipe. The pork legs or pata is chopped and grilled in live charcoal and then it is boiled with monggo beans until fork tender. I love the smoky flavor added by the grilled pork legs in the regular monggo soup. 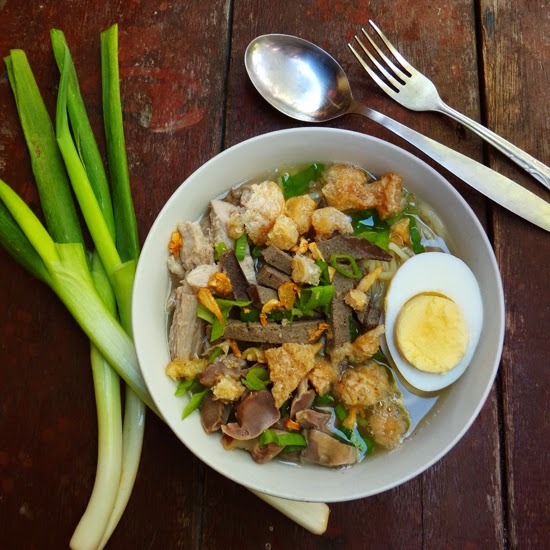 However, La Paz Batchoy is the dish he never cooked at home. I remembered when we were young, whenever we went out on Sunday, Ilonggo Grill was my dad’s choice of fast food restaurant. He would always ordered La paz Batchoy from the menu. We tried Ted’s La Paz Batchoy but he still prefer the Ilonggo Grill’s La Paz Batchoy. Anyway, since we haven’t cooked La Paz Batchoy at home, I decided to give it a try. Ofcourse, my dad will be my number one critic being a pure blood Ilonggo. The wet market near us has unusual scarcity of beef bones so I settled we pork bones. However, if you happened to grabbed some beef bones, you are lucky enough. I think I should have go to the market before sunrise to get some beef bones. Anyway, in this recipe, I used pork bones instead of beef bones but beef bones is highly encourage. I simmered the pork bones for 2 hours using wood fire but if using beef bones, it should take four hours for full flavor. I added some sugar, salt, pepper, onions and garlic into my soup and let it simmer for another 15 minutes. I also added my pork meat with the pork bones but took it out after an hour. On a separate pot, I boiled to tenderness the pork innards and sliced it. Using the water used to boil the innards, I added the pork liver and boil it for 20 minutes and sliced it. Then, I sauteed some garlic until golden brown and set it aside together with chopped onion spring. To arrange, simply add enough fresh egg noodles, topped it with your choice of meat, crispy garlic, onion spring, eggs and chicharon Pour soup over the noodles and enjoy. I really enjoyed this one since it’s perfect with the cold weather. As my father’s verdict, well it’s acceptable but it would be perfect if beef bones were used. Well, there’s next time to try it out. Combine beef bones or pork bones and water in a pot. Simmer for two hours if using pork bones and four hours if using beef bones. You may want to add additional cups of water along the way so not to dry out the broth. Add garlic and onion and simmer for another 15 minutes. Add the sugar and season with salt and pepper to taste. To arrange, in a bowl, add enough fresh egg noodles and topped it with pork innards, liver, eggs, toasted garlic, spring onions and a generous amount of chicharon. Don’t be shy with the chicharon. This is a comfort food and you won’t eat this everyday, so let yourself enjoy.